Summer is all about hot weather, vacation, and leisure. Unfotunately, most exiciting tropical vacations don’t last more than two weeks and when we’re back home it’s same old routine but dressed in idle summer heat. 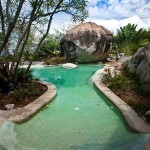 Well, there are a few things you could do to create an ultimate vacation spot in your own backyard. 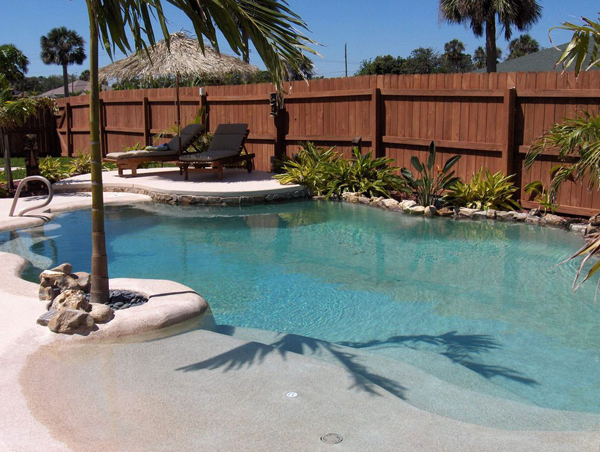 If a beach entry pool is not for your budget then you can transform backyard into an ocean-inspired beach strip. A beach entry swimming pool is a great way to always have a place to escape from day-to-day life and relax sipping freshly squeezed juice or mojito. 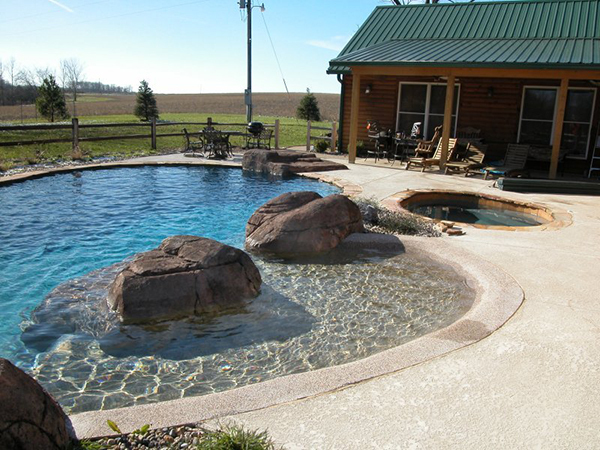 Built by professionals a beach entry pool features a shallow sloping entry that makes for a nice ocean-like swimming experience and look. 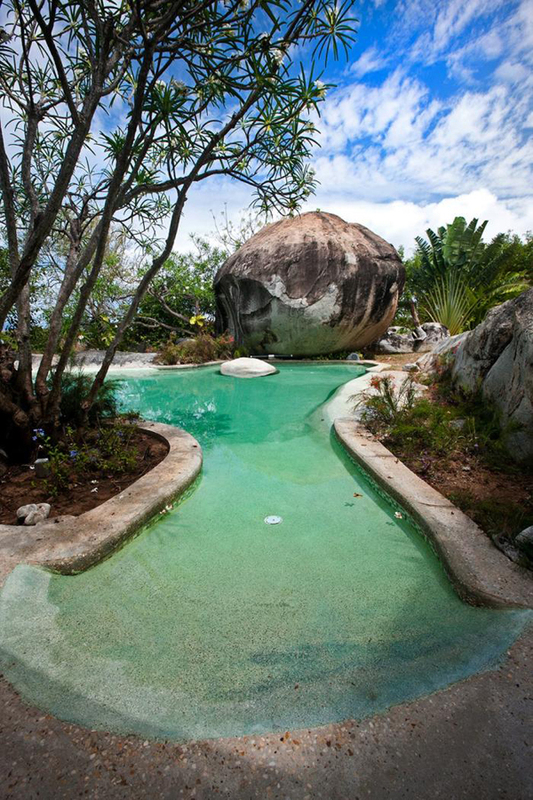 It can be filled with sand and it can be made out of stone or tiles to mimic the beach. 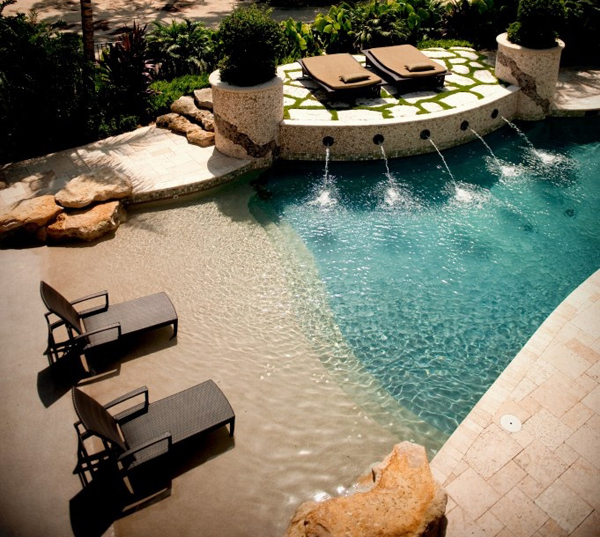 Such pools can also be natural or decorated with stone and a waterfall. 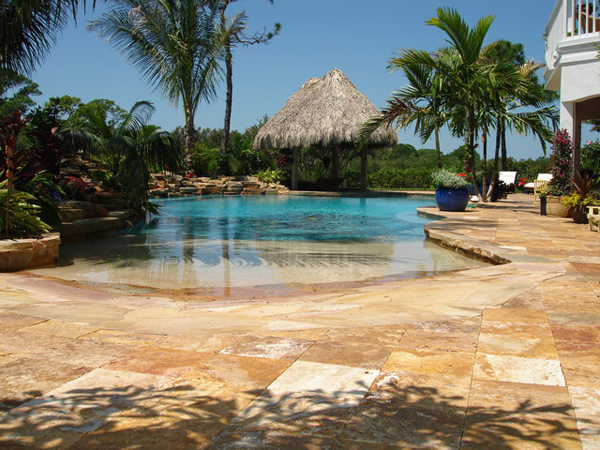 To make the most of your beach entry pool add a beach strip to your backyard with clean beach sand or other clean chemical-free sands from a landscaping company. 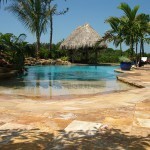 If your climate allows it you can plant a few tropical plants to emphasize the resort-like look. Some cold hardy tropical plants include a palm Trachycarpus fortunei, needle palm Rhapidophyllum Hystrix, Elephant’s Ear, and fiber banana for luscious look. Other attributes of the exotic resort that you can use in your own vacation spot is a swimming pool bar, beach chaise longues, and an umbrella. For the ultimate getaway build a tiki hut or a stylizied pergola to provide you with shade and a cozy resting space filled with exotic printed cushions and throw pillows that will make you forget that you are in your hometown without the hassle of flying.